Welcome to new readers! I’m so glad you found my website and The Purple Elephant book! I write books for kids from kindergarten through middle school and my books are filled with humor, usually in the form of animals doing things animals don’t usually do! Like Duck, who owns a farm, and the purple elephant who… well, I don’t want to spoil any surprises. I came across this picture the other day and it is purportedly not photoshopped. 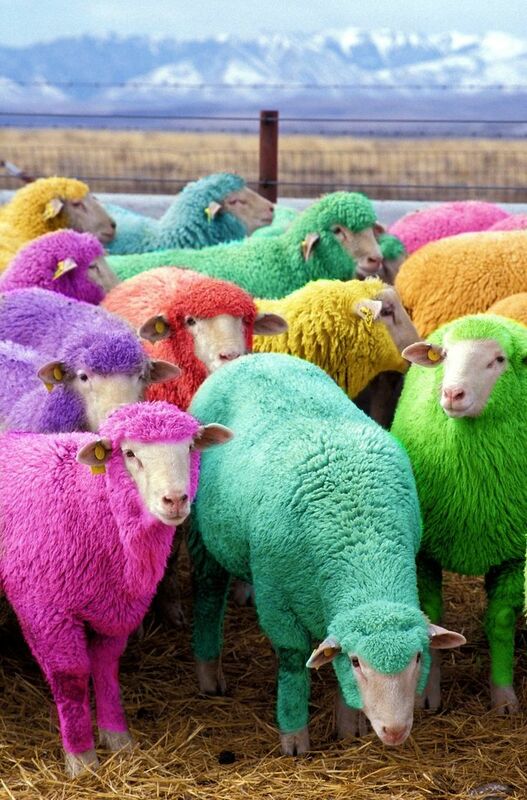 There is a famer in Scotland who dyes his sheep for the amusement of tourists. I thought something like this would be perfect for a Duck and Friends story. Welcome! Here is the blog page for my brand new website! In this blog I plan to post news about upcoming book releases and events, but I will also post reviews of other children’s books, occasional author interviews and other interesting tidbits relating to children’s literacy or whatever I want to write about. 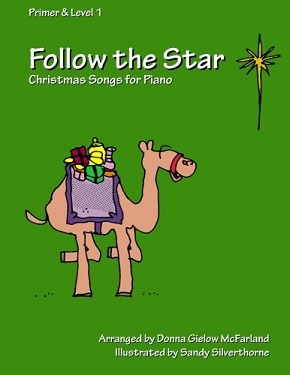 In today’s news, I am excited to announce that my newest music book: Follow the Star: Christmas Songs for Piano (Primer & Level 1) is going to be released very soon! I am expecting to receive the proof in the next couple weeks. This book is designed for new piano students who are still at the primer level or maybe beginning a level one method book. It begins with a very simple, middle C position “O Come Let Us Adore Him.” There is a one-handed “Jingle Bells” with optional teacher accompaniment, “Silent Night,” “We Three Kings,” and lots more. In the Level 1 section the arrangements contain more hands-together playing on songs like “Joy to the World,” “Pat-a-Pan” and “O Come Little Children.” The book is illustrated with cute drawings by artist Sandy Silverthorne.